In 1980, a group of friends got together to make a very low budget, independent horror film that they called The Evil Dead. They didn’t know then that their little movie would spawn 2 sequels, a remake, a television show, and a plethora of toys, video games, and comic books. They didn’t know their film would launch a franchise and turn their lead into a legend. That’s exactly what happened, though, and the Evil Dead franchise has remained a pop-culture phenomenon in its almost 40-year existence. Ash Williams has become a folk hero, a myth, a legend. With his trademark chainsaw and “Boomstick,” Ash is as much of an icon as his villainous peers, Freddy, Jason, and Michael. He’s one of the good guys though and, despite his narcissism, potential alcoholism, and general buffoonery, he has somehow captured our hearts and imaginations for almost 40 years. Ash has gone from a bland “final boy” to an action hero, to a chosen one and back again. 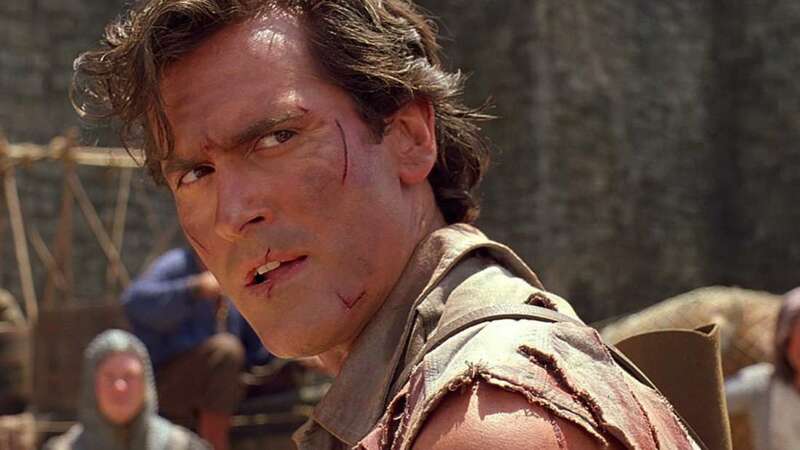 He has saved more people than he’s lost and he is the pinnacle of the “everyday man” who becomes the “reluctant hero.” Ash is somehow an amalgamation of who we all desperately want to be, who we never want to be and who we actually are and that is why his legacy has endured and it is one of the many reasons why the Evil Dead films, even the one Ash isn’t a part of, have endured for so long. Remakes are usually a disappointment. Often times, they are made just to cash in on the nostalgia for the original. Films like A Nightmare on Elm Street and The Texas Chainsaw Massacre failed to capture the essence of the originals and they lacked anything new and/or different to even warrant their existence. The Evil Dead remake, however, captured the spirit of the original while also offering a new take on a familiar story. Though the remake lacked our hero Ash, it did produce a new reluctant hero in the form of Mia – a drug addict who is desperate to kick the habit. To do so, she enlists the help of her brother, his girlfriend and various other friends. Together, they travel to an old family cabin for an intervention/detox weekend. The motivations for going to the remote cabin are a lot different than in the original, but that instantly makes us care even more about the characters. They’re not at the cabin to “party down.” They’re there to help their friend. Mia is the real star of this show. She is tasked with playing a drug addict, a deadite, AND our “New Ash” and she handles all of the responsibilities that come with the part like a champ. The amount of abuse she takes would make Bruce Campbell proud. Despite being possessed early on in the film, Mia battles her demons, both literally and figuratively and becomes the female equivalent of everything the real Ash represented. Mia is scared and scarred. She is fallible, which makes her relatable. She is reluctant but determined and she becomes the hero that even the most diehard Ash fans can respect. 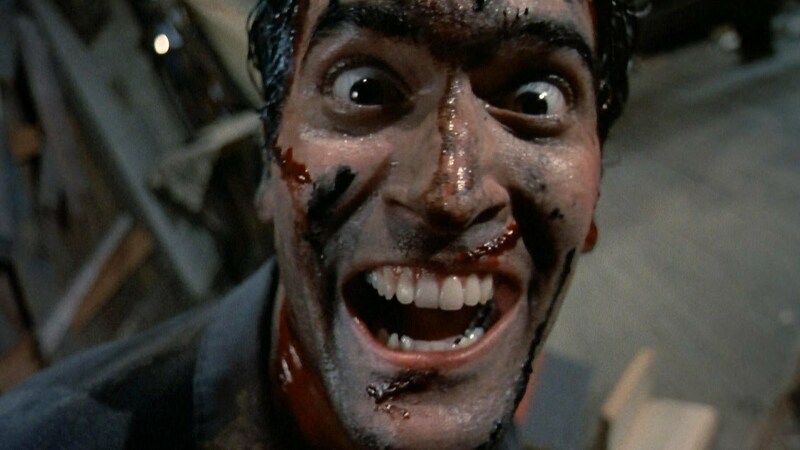 Some would argue that the original Evil Dead is the ‘scariest’ of the series and it’s easy to see why. While Evil Dead 2 and Army of Darkness drifted into comedy territory at times, the original was almost strictly horror; campy horror, but horror nonetheless. Now, even almost 40 years later, Evil Dead is still scary! The story is a typical one – 5 friends travel to a remote cabin for a weekend of “partying down.” What would a party be, however, without a few demonic possessions? After unwittingly summoning “the Evil Dead,” via the Necronomicon (aka the Book of the Dead) Ashley Williams and his friends are suddenly in a fight – not only for their lives but for their very souls. What The Evil Dead lacks in budget, it more than makes up for with ingenious practical effects, stunning camera work and a hell of a lot of blood. Purchase now on Amazon for $9.92. While the original Evil Dead is the scariest film in the series, Army of Darkness (or, Medieval Dead, as it was once called) is probably the funniest/most action-packed. At the end of Evil Dead 2, Ash is sucked through a vortex and transported via time-continuum to the medieval period. While there, Ash is first thought to be a witch and he is held captive. After surviving what was sure to be a death sentence, Ash proves himself to be quite the leader and is quickly believed to be “the chosen one,” spoken of in the Necronomicon, to free the people from the evilest of the dead. Always the reluctant hero, Ash is more concerned about getting home than in being a savior. Still, he straps on his Boomstick and his chainsaw and prepares to take on an entire Army of Darkness, led by his evil doppelgänger. Purchase now on Amazon for $12.79. Evil Dead 2, which is really more of a remake than a sequel to the original, is the best Evil Dead film. It is the perfect amalgamation of the horror from Evil Dead and the humor/action from Army of Darkness. It is, really, the perfect scary movie to watch on a dark and stormy night. ED2 again utilizes practical effects and the notorious “Raimi-Cam,” for many of its signature shots. It also portrays Ash as less of a dork and more of a hero. He’s not quite the wise-cracking, sweet-talking superhero of AOD, but he’s on his way. Evil Dead Par Deux also gave us a bit more backstory with the Necronomicon and the professor who thought it would be a good idea to recite and record the passages that were, supposedly, “inked in blood.” Evil Dead 2 is the best film of the series, but the series itself is one of the best in horror movie history. It is a story of a reluctant hero who comes face to face with his destiny and must choose between being a coward and being a hero. Despite his grumbles, Ash Williams chooses the latter, becoming a legend in the process. Ash is the chosen one and he is the only one that can stand between the rest of the world and the Evil Dead.